Focusing solely on risk to one’s health, vaping is most likely better than smoking. However, in my experience, vaping produces a high that is not quite as good (or in any event, different) than the high (and variety of types of highs) smoking produces. What do ya’ll think? I prefer health over high so I typically stick to vaping. I like to vape at the start of days, and at the end of nights. Anything in between requires immediacy, hence it’s probably being smoked out of the old bowlski. Typically I’m vaping flower (if I’m vaping), but I am fond of the portability associated with vape pens/cartridges. 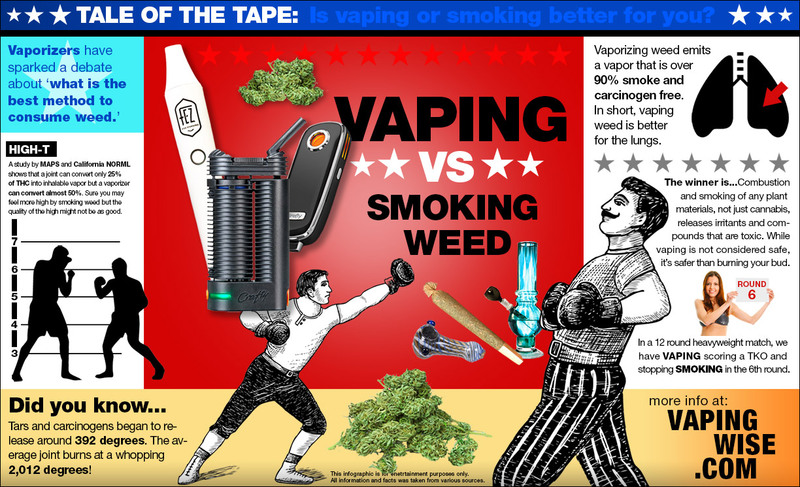 Vamping is the preferred choice over here, though is vaping really healthier? It’s such a new thing that I can we know that for sure? Really, that’s a legit question. Anyone have an answer? Whatever the case, the ability to take it on the go and vape without a bunch of smoke or smell makes it a winner.